High-rise buildings aren’t a modern invention. Ancient mosques, churches, fortresses, all were magnificently huge buildings. Back then, the purpose of making a bigger building was to show grandeur, construction prowess and even show superiority. Nowadays, high-rise buildings are a common site in developed countries, where the city’s skyline is made up of a mix of different but dominating architectures. The development of high-rise buildings began as a crucial necessity when urban centers were no longer to expand horizontally, and thus, needed to expand vertically. High population growth rate in urban centers means that land prices sky rocket, less space for expansion on the outskirts of the city and thus high-rise buildings provided a solution: more space for residential as well as commercial spaces within the span of the city. Unfortunately, this trend of adopting high-rise buildings hasn’t been widely adopted in Pakistan. Especially in Lahore, the city seems to be expanding more and more. Development of housing schemes on the outskirts of Lahore, some as far as 50 km away from the main city show how much demand there is for residential areas in this urban center. Islamabad and Rawalpindi, initially two nearby but separate cities, now overlap each other’s territories as the cities expanded to meet the rising population. 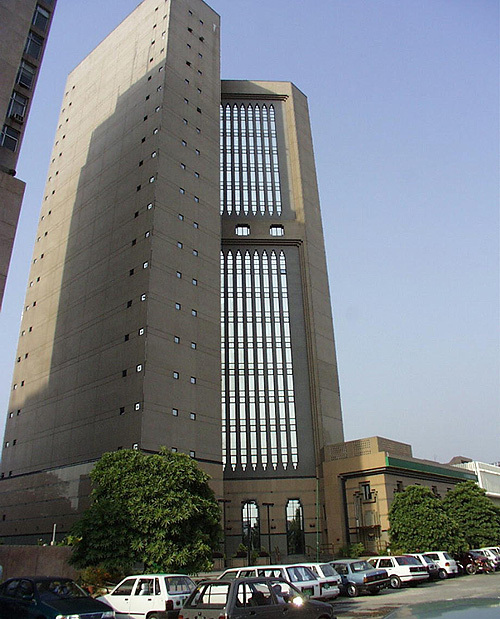 However, Islamabad is one of the few cities in Pakistan where there is a greater trend for building high-rise buildings as compared to other areas in Punjab. Similarly, Karachi, which is one of the biggest urban centers of the country, first grew in increasing horizontal magnitude, before the trend of using apartment buildings became popular. Now there are large areas dedicated to high-rise apartment buildings to overcome the scarcity of residential space in the overpopulated metropolitan. There are many advantages of making plentiful high-rise buildings in the city. First of all, they provide an immediate solution to the lack of space in the city. More and more people are able to live closer to their jobs, friends and family. It also removes the need for expanding the city and risking that it takes over other important areas like agricultural lands adjacent to the city. Secondly, high-rise buildings allow the city’s skyline to be more noticeable. Architects of big urban centers in developed countries use the city’s skyline as their canvas and paint it with beautiful and magnificent buildings with varying designs. The building itself provides a stunning view of the surrounding city and provide a visual advantage over other buildings. In this way, the city also becomes more noticeable and encourages maintenance of areas surrounding the building. Finally, it promotes the city as an abundance of high-rise buildings in a growing metropolitan shows economic growth and stability, encouraging tourism. And with an abundance of living areas, the tourists can be accommodated easily. Of course transitioning from a conventional city to a skyline dominated by skyscrapers is difficult for a country like Pakistan. However, a small step could be to incorporate high-rise buildings into development projects which include both commercial and residential spaces, like malls with apartments on upper floors. And soon after, there can be dedicated towers for offices and others for living.